TURKIS RAILWAY - railmeds JimdoPage! passenger transport and about 10% of freight transport. Main goods in freight transport are: agricultural products, livestock, foodstuffs, fodder, solid fuels, petroleum products, ores, metallurgical products, construction materials, fertilizers and chemical products. The Turkish railway network is operated by the Turkish Railway Company (TCDD). - About 17,000 goods transport wagons. In the past years the investments in road and rail infrastructure have been increased significantly. The focus of investment switched from road to railways. Turkey has ambitious plans for a high speed network with operational speeds of up to 250 km/h. A first step was completed in 2008 within the Istanbul – Ankara line. The line Ankara-Eskisehir is operative since March 2009. _ Ankara-Sivas– operation planned for 2012. _ Syria: open – 1,435 mm. Railways, Ports & Airports Construction (DLH). The list of the projects is as follows. For projects after 2014, technical studies for a strategic railway plan and a master plan are ongoing. The proposed regional rail link from Turkey is illustrated in the following map – Kapikule (Bulgarian border)- Haydarpasa (Istanbul)- Eskisehir-Konya-Yenice-Mersin Port/Iskenderun Port Link (Syrian border). The Turkish State Railways (TCDD) became a state owned enterprise in 1984. The last major restructuring process of the Turkish State Railways started in 2003.
employees are working in TCDD. separate railway networks (in Thrace and Anatolia) that are only connected through the Bosporus railway ferry in Istanbul. There are two authorities in charge of the railways, the General Directorate of Railways, Ports and Airports Construction (DLH) and the General Directorate of Turkish State Railways (TCDD). DLH, being one of the central units under the Ministry of Transport (MoT), is responsible for overall planning programming, design and construction of public railways (including urban rail mass transport), ports and airports infrastructure and the approval of private sector projects in these related fields. there are 18 specialized departments and 7 Regional Directorates countrywide. new legislative and institutional framework for the Turkish rail sector in accordance with the EU acquis. _ Access to Railway Infrastructure. Final drafts of the laws and implementing regulations were approved as a package by the project leaders in 2007 and submitted to the Ministry of the Transport, the main beneficiary of the project. separation of accounts between goods, passenger, infrastructure and PSO, railway safety and interoperability, as well as re-organization of TCDD in line with the General Railway Law. Technical studies on the draft laws are ongoing. The laws are expected to come into force by the end of 2009.
has been prepared by TCDD. The objective of the project will be to establish framework conditions for restructuring and reforming the rail sector for competition, including systems for infrastructure allocation, charging, safety and interoperability at TCDD. The bidding process for the project is ongoing. The project will start in 2009 and will be finished within 24 months. Infrastructure management and train operations are not separated in terms of accounts for the time being. Also passenger and freight operations are not separated. Technical studies on separations are ongoing. Separation is planned for 2010, once the draft laws mentioned above have come into force. There is no Railway Safety Authority in Turkey. However, it is planned to establish the necessary bodies as mentioned in draft “General Railway Law” in 2010.
such board/commissions conduct a detailed study on the accident and elaborate a report to submit to DG. As a result of these studies, if required, necessary measures to prevent accidents are taken. All statistical data about accidents are kept in the related departments. In case of serious accidents, TCDD may ask an independent board to investigate the accident. transport rail is still underrepresented. 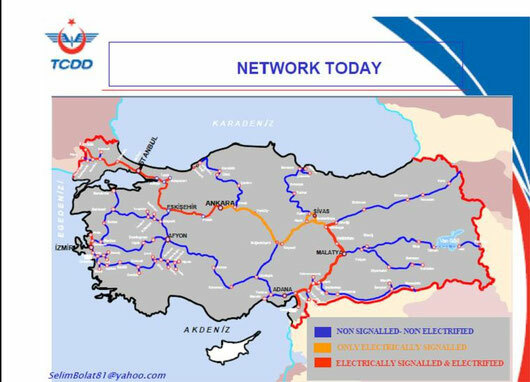 Turkey launched an ambitious investment program to upgrade the network and to implement high-speed lines until 2012. These will mainly improve the national transport. Turkey’s proposition for a regional rail (freight) corridor is the link between the Bulgarian border and the Syrian border. The structural reform according to European guidelines has been started. The separation of infrastructure and operations is not realized, the same is true for the separation of freight and passenger operations. They are planned to be separated in 2010 after a new laws enters into force. There is no Railway Safety Authority in Turkey. However, it is planned to establish the necessary bodies in 2010, as mentioned in the draft “General Railway Law”.